Today marks the third anniversary of the earthquake that leveled Haiti. Three years ago this magnitude 7.0 earthquake severely damaged an already struggling nation. Lutheran World Relief had already been at work in Haiti for fifteen years, but we increased our presence there to help people recover from the earthquake. Three years after the earthquake, we continue our work. We are focused on helping farmers in the north of Haiti, investing in those areas where we have strong expertise. We invest in agricultural training and development, so that local residents have a long-term stability and success. 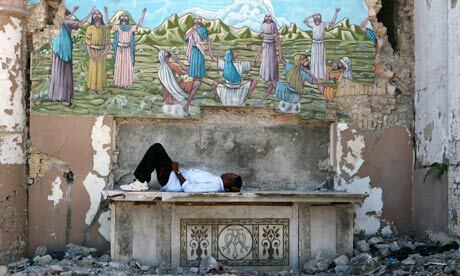 The Guardian has an article about how Haiti's media bemoans the slow reconstruction effort but retains a sense of optimism. How can Haiti get back on its feet, 3 years after quake? AlertNet interview experts and aid officials about what donors and the Haitian government need to focus on to help the country get back on its feet and tackle long-standing economic and social problems. This New York Times' editorial looks at the challenges and misplaced aid that flowed into Haiti after 2010. The Washington Post tells the story of how one Haitian finds hope through running. What would you hope to see happen in Haiti?